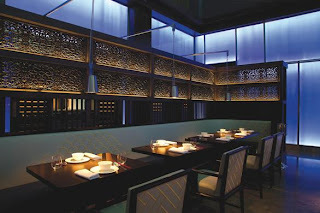 I dined at the Mayfair Hakkasan two years ago courtesy of Dinesh and Minal Vazirani of Saffronart. It was after a discussion on 'Junctures and Departures: Locating Modern and Contemporary Indian Art' at Saffronart's Bond Street gallery. I recall the food being good though not exceptional. What struck me most about the space was how crowded it was. Also, the waiters going around asking each diner about food allergies. I've also dined at the restaurant which used to occupy the space where Hakkasan, Bombay, is now located. It was called Seijo and the Soul Grill, and its main dining area was demolished the day after we ate there. I believe that was a coincidence. Apparently, Hakkasan has fulfilled license requirements by building a completely retractable roof, so it's unlikely to face the same fate as Seijo. It looks sturdy enough to make a believable indoor space; ripples of light pass over the slanted wooden ceiling as if there were a swimming pool somewhere; it's just the work of some fancy projectors. The service, we found, is faster than McDonald's, if you count the queueing up time at McDonald's on a Saturday night. We walked into Hakkasan at 8.30, and our mains were in front of us at 8.40pm. We were done eating by nine, having consumed delectable, melt-in-the-mouth pork belly, and some chicken that came in an intriguing pickle-flavoured gravy. There was just a hint of that gravy, of course, nothing like those bits of reconstituted flesh swimming in sauce that one is used to in Sino-Chinese fusion cuisine. For dessert we moved down the street to San Churro, which serves the best Espresso Mocha and the best thick hot chocolate in the city. Hakkasan claims to have a dress code, and I suppose they turn away guys in shorts. Even Olive does that. But already, Bombay's famously casual attitude to clothing, one of the things I like best about the city, is having an impact. There were plenty of people in T-shirts, jeans and shirtsleeves. Which fits the place really, because, though Hakkasan's pretty expensive, it doesn't seem opulent.